INTERCATHEDRA presents original scientific papers covering mostly problems of economics, food economy, rural areas, regional policy on rural areas, human resources management, rural labour market, social policy on rural areas, finance management in agri-business companies, agricultural real estate market, consumption of agri-food goods as well as wood and forestry economics. It is a continuation of non-periodical journal “Issues of Wood Industry Economics”. In 60’s of the last century, the journal published the Department of Wood employees’ research results. Since 1985, INTERCATHEDRA was published regularly once a year, and since 2011, it has been functioning as a quarterly. 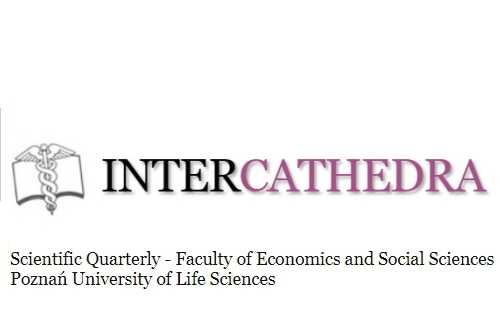 The INTERCATHEDRA journal is published by the Scientific Publisher of the Poznan University of Life Sciences. Until September 2017, Prof.nadzw. dr hab. Wojciech Lis was the editor-in-chief of the journal and since October 2017, this function is performed by dr hab. Sławomir Kalinowski. Original scientific papers in English (preferred) and Polish are published in the Scientific Quarterly INTERCATHEDRA. The articles are evaluated by independent reviewers and a content-related editor and texts are verified by a native-speaker. Currently the Quarterly is indexed in BazEkon, Agro-Librex and Index Copernicus databases. According to the “Unified List of Scientific Journals” of the Ministry of Science and Higher Education, 10 points are granted for a paper published in INTERCATHEDRA. The editorial office provides free access to the full text of the all publications on their website. This journal is the open access and non-profit enterprise. The published papers may be collected, read and downloaded free of charge – with Author’s rights reserved. We have adopted a Creative Commons licence CC BY-NC (Attribution – Non Commercial).